Page Stationery is based in Richmond, Virginia. They offer a mix of invitations, gift cards, boxed notes, letterpress and such, but I'm privy to their custom men's line. This line perfectly encapsulates the many facets of a southern gentleman. They have almost two dozen options of modern, sophisticated note cards that are a mix of charming, preppy, refined and bold. I really think every guy needs his own custom set of note cards, don't you? 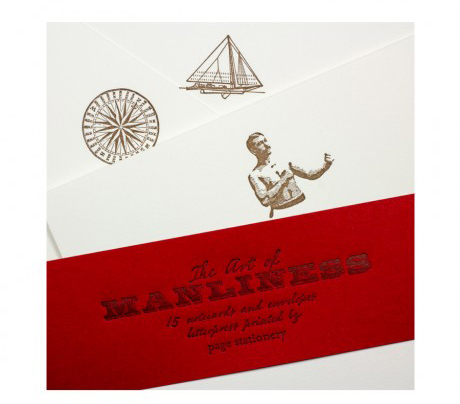 Recently, The Art of Manliness (a fantastic manly blog you need to bookmark), collaborated with Page Stationery to create a line of letterpress correspondence cards. These cards are classic and timeless with just enough space for a quick, heartfelt note. And we all know, a hand written note goes a long way in this day and age. Because of its rarity, it's impactful, remembered. I like how this line speaks to the southern gentleman, both visually and symbolically. Check out the Page Stationery shop to see all their beautifully designed offerings for not just men- but kids and women too, here.